Florida is a paradise for golfers and there is a huge range of golf courses within an easy drive of our Villa to suit all abilities and pockets. 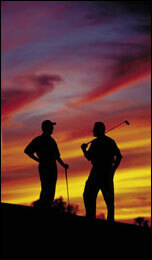 If golf is your passion there really is a myriad of choice. This is by no means a complete list of all the golf courses in the Orlando area, but a selection of those that we'd advise you to play. We've listed our favourite top ten on this page, and the icon link is to the golforlando website. This gives a much better idea of how to rate the course, which is best done by reading the review section at the bottom of the link page. If you want to visit the club website then the link is on the heading. You have to be very careful when choosing courses in the Orlando area as quite a few have condos or housing development lining the fairways. This is not always appealing to European golfers. It doesn't mean to say that they are not great golf courses, but for some people it's not the golf experience they are looking for. Our particular favourites, other than the unrivalled Championsgate National and International, are Diamondback and Timacuan. They're a bit further a field but worth the extra drive, and for value for money they can't be beaten. They give you the true Florida golf experience just how you want it. Plenty of spectacular par 3's over water, tree lined fairways, and always in fantastic condition, and with all the wildlife to go with it. Carved through untouched forests and wetlands you might find the odd alligator or snake to keep you company. If you want this kind of thing closer to your villa then Falconsfire, Metrowest and Celebration will cater for your needs, although they are a little more expensive, nevertheless there are many other courses right on your doorstep that are worth a visit. If you want more choice then check out these links - GolfingOrlando / GolfforOrlando / GolfGuideweb, or just pick up one of the many free golf directories found in the numerous golfing outlets around the Kissimmee and Orlando area. ChampionsGate Golf Resort features two 18-hole championship courses designed by accomplished architect and golfer, Greg Norman. 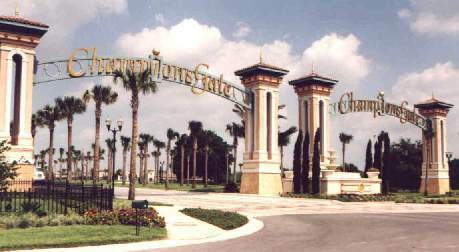 The complex opened in 2000 and within the first year was already regarded as one of the top golf facilities, not only in Florida, but the United States. This complex is only two minutes drive from your Villa! » World headquarters for the David Leadbetter Academy, the most sophisticated learning facility for men, women and children. Leadbetter is ranked #1 among Golf Digest's "50 Greatest Teachers" in America. » Received honourable mention by Golf Magazine's "10 Most Distinctive places to Play" in the Country. » Hosting the 2002 Florida State Amateur Championship. » Hosting site for the Canadian PGA Tour Qualifying School for 2002-2005. » International Course carries the highest course rating in the State of Florida at 76.3. » The facility features two l8-hole championship golf courses, a driving range, greenside fairway, bunkers, short game area and putting green. » The PROLINK GPS system is standard on all the golf carts. » A 30,000 square foot clubhouse offering amenities including a full-service golf shop, grill room and a banquet facility that offers complete services for golf tournaments and special events. The impressive clubhouse, restaurant and banquet facility is matched only by the attentive and professional staff. Guests will enjoy the expansive veranda, one of the most distinctive features of our luxurious clubhouse, which overlooks a beautiful wetland and offers panoramic views of both golf courses. They will also enjoy the service, the unique menu and the comfortable ambience - reminiscent of a fine private country club - that is the hallmark of ChampionsGate's guest experience off the course. The impressive clubhouse includes complete dining and lounge areas, a fully stocked golf shop, guest lockers, and function space for up to 250 people should you wish to tie the knot on your holiday of a lifetime. Diamonback Golf Club - Opened in 1995, this is another of Joe Lee's great Florida layouts, located directly across the street from Grenelefe Resort in Haines City, about 40 minutes west of Orlando's International Drive. The course was carved from 240 acres of virgin forest and offers dramatically rolling fairways bordered by dense trees, pristine natural wetlands, and well-positioned water hazards. Diamondback is situated in a non-residential environment, which is unique to the Central Florida area and creates a very peaceful round of golf. Always in excellent condition, this course has been rated four stars by Golf Digest's "Places to Play." Falcon's Fire - This Rees Jones signature design pays respect to the timeless traditions of the game of golf. The front side is forgiving with water on three holes, while the back wraps around two large lakes with a run of holes (12-18) that will challenge the most skilled player. Boasting tournament playing conditions 12 months a year, the course is arguably the finest maintained in Central Florida. Falcon's Fire has often hosted such events as the Senior PGA Tour Qualifying School and the Oldsmobile Scramble National Finals. Truly a complete facility, Golf Shop Operations has rated the pro shop as one of America's "Top 100 Pro Shops." Falcon's Fire is located in Kissimmee, just off Highway 192. Celebration Golf Club - Located within the thriving master-planned Celebration community, the Celebration Golf Club boasts one of the finest daily fee golf facilities in Central Florida. The renowned father-son team of Robert Trent Jones, Sr. and Jr. sculpted a park-like atmosphere within the natural wetland environment, creating a truly serene golf experience. The course boasts rolling terrain that weaves through a series of pristine lakes and periodic clusters of native oak, pine and magnolia. Timacuan - A must-play while in Orlando, Timacuan is a stunning 6,900-yard championship course. Designed originally by Ron Garl in 1987 and totally renovated by Bobby Weed in 1996, the course features two very distinct nines. The front resembles a Scottish links in places with rolling fairways bordered by sandy waste areas and deep pot bunkers. The back has the feel of the finest Carolina pineland courses with water almost everywhere you look. Add outsanding club facilities and a first-class staff and you quickly understand why Timacuan is so good! Metrowest - Designed by renowned architect Robert Trent Jones, Sr., MetroWest is a classic design blended with a landscape of changing elevations. The course offers wide fairways, large, undulating greens guarded by numerous grass and sand bunkers. Opened in 1987, it remains in superb condition year-round and is known for having some of the best-conditioned greens in Florida. Westerly's Restaurant is conveniently set above the golf shop and is open for breakfast, lunch, cocktails and appetizers. Located in the Bay Hill area, only minutes from Universal Studios Orlando, MetroWest has hosted the US Open Regional Qualifier and the Senior PGA Tour Regional Qualifying. Orange County National - Panther Lake, voted Golf Magazine's "Top 10 You Can Play" in the United States in March 1998 and more recently awarded 4 1/2 Stars by Golf Digest's "PLACES TO PLAY" for 2000, was designed to showcase the native beauty of the Florida landscape. This 7,295-yard masterpiece is the first course ever to feature 18 signature holes, incorporating rolling hills, including 60-foot elevation changes, as it winds through natural oak hammocks, pine forests, scenic wetlands and glistening freshwater lakes. In addition to its natural beauty, Panther Lake offers numerous strategic options in its design, thus allowing all players to be fairly challenged. Southern Dunes - A truly unique layout, this award-winning course has been ranked among the "Top 100 Courses in America" by Golfweek and awarded four stars by Golf Digest. Steve Smyers' design features imaginative bunkering and large sandy scrub areas that line dramatically rolling fairways. Unusual for Central Florida, the course has elevation changes of up to 100 feet and a series of huge dunes that give it even more character. Best of all, the Tifdwarf Bermuda greens are large, true and fast. This first-class club has added a great new golf shop and is located just 20 minutes from Highway 192 area in Orlando. Highlands Reserve - Set atop one of the highest areas of the state, Highlands Reserve is not your typical Florida golf course. This championship design by Mike Dasher gives you tree-lined fairways reminiscent of the Carolinas, open spacious fairways likened to the great Scottish courses, and a bit of old Florida with citrus trees dotting the countryside. Large, fast, undulating greens make this course challenging and fun for all levels of golfers. Conveniently located just minutes from Walt Disney World and all major attractions, Highlands Reserve Golf Club is a Central Florida favorite! Since opening its doors in 1998, Highlands Reserve has been one of Golfpac's most requested courses by golfers worldwide, and customers continually rank its customer service, course conditions, and professional staff as top notch. VILLAMAGIC- Luxury 5 Bedroom Villa Orlando Florida Copyright © 2005 Villamagic, All Rights Reserved.